Instructor User Guide Drop BoxHow do students add items to the Drop Box? The Drop Box tool functions very much like the Resources tool. The only difference is that Drop Box is an individual folder for each student within a particular course. You will see a Drop Box folder with your name as the folder name. This is the location where you will add or create items in the Drop Box. 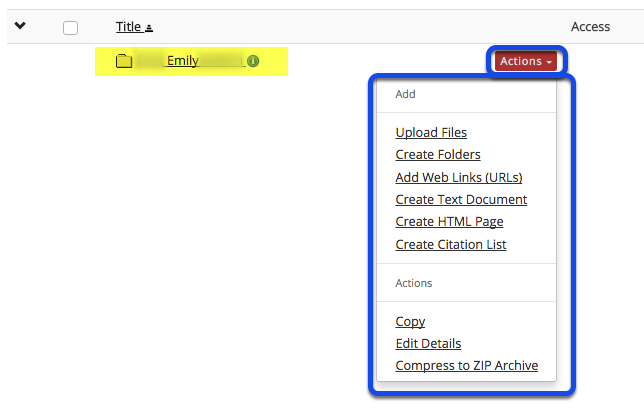 Click the Actions drop-down menu complete any of the following tasks. The Drop Box functions mirror the functions of the Resources tool. See What is the Resources Tool? for more information. Prev: How do I upload files to multiple dropbox folders?